Classroom Management That Works 0 Edition How does classroom management affect student achievement? What techniques do teachers find most effective? 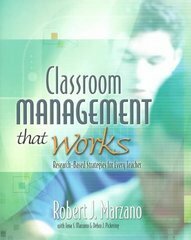 How important are schoolwide policies and practices in setting the tone for individual classroom management?In this follow-up to What Works in Schools, Robert J. Marzano analyzes research from more than 100 studies on classroom management to discover the answers to these questions and more. He then applies these findings to a series of "Action Steps"--specific strategies that educators can use to* Get the classroom management effort off to a good start,* Establish effective rules and procedures,* Implement appropriate disciplinary interventions,* Foster productive student-teacher relationships,* Develop a positive "mental set,"* Help students contribute to a positive learning environment, and* Activate schoolwide measures for effective classroom management.Marzano and his coauthors Jana S. Marzano and Debra Pickering provide real stories of teachers and students in classroom situations to help illustrate how the action steps can be used successfully in different situations. In each chapter, they also review the strengths and weaknesses of programs with proven track records.With student behavior and effective discipline a growing concern in schools, this comprehensive analysis is a timely guide to the critical role of classroom management in student learning and achievement.